Adding moisture and curl definition to hair couldn’t be easier with Aveda Be Curly Style-Prep. This wonder product detangles, reduces breakages and tames. Aveda Be Curly Style-Prep. Leaves hair soft. Aveda Be Curly Style-Prep makes styling simple and leaves hair soft, not “crunchy”. Wheat protein and organic aloe blends expand when hair is wet and retracts when dry to intensify curl or wave. Organic baobab and babassu oil and macadamia nut help seal and soften hair. Guar bean and plant-derived cellulose help maintain curly styles throughout the day, whilst certified organic lime, lemon, bergamot and orange create a light, refreshing aroma. Apply daily after Aveda Be Curly Shampoo and Conditioner. To prepare hair for styling work a small amount of product in hands, apply evenly through damp hair and comb to distribute. Do not rinse out. 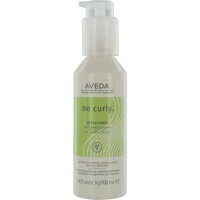 Style with Aveda Be Curly Curl Enhancer to intensify curl, fight frizz and boost shine. To reactivate curls on non-shampoo days, dampen your hair and apply. Comb through to distribute evenly and style. Air-dry or blow-dry with a diffuser.